This is the first time I’ve made something to enter in more than one challenge. This is for the Lawnscaping Challenge on Tags and the Raisin Boat Challenge #6 Thank You. I used a Raisin Boat set I got from a friend called Central Park and some Lawn Fawn stamps that I’ve been wanting to play with called Blissful Botanicals. I like that the tag looks quite layered even though there is only one layer. Then I added a little texture and dimension with the twine and button. 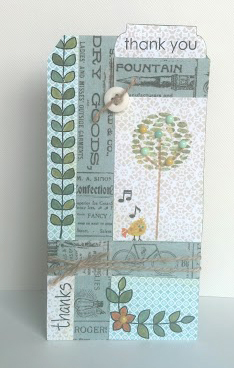 Everything is colored with my Beloved Tim Holtz Distress Markers. Lately, I’ve been wanting to work on bringing in more elements and still having the finished card or tag look cohesive rather than chaotic. Also, I don’t have kids. There. I said that too. And no, that won’t be changing. Really. I swear. So what’s a crafter to do? Go to any gathering of crafty women and you see the scrapbookers working on “First Day of School”,”Pumpkin Patch”, or “Kid Playing in Sandbox” layouts. Maybe even “Our First Puppy”. I don’t even have a puppy. But I LOVE so many other artsy things and I figured there have to be more people in my position. So I searched Google for “crafting without kids” and I got 0 hits. 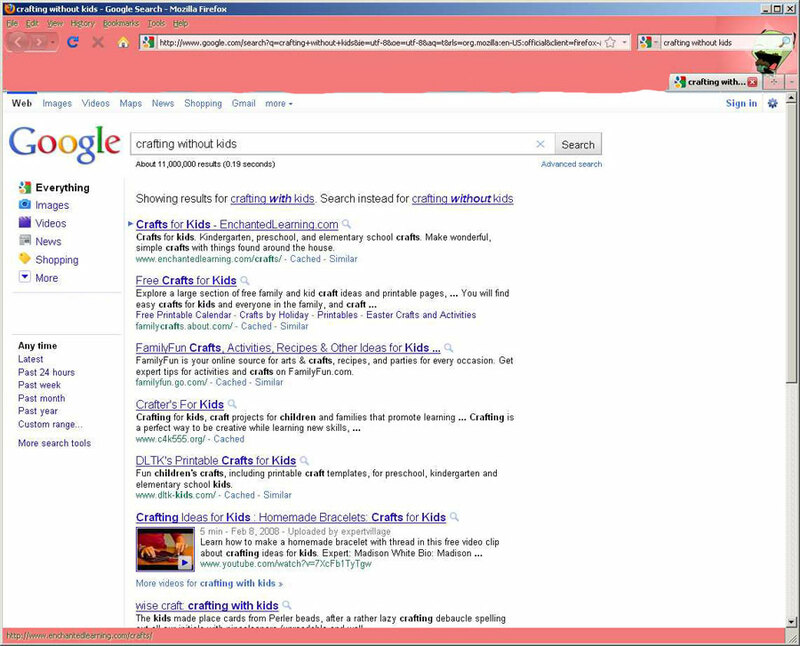 In fact, Goggle thought I meant “crafting WITH kids” so these are the results they gave me. Even Google didn’t believe me! Then I looked for a Meetup.com group that I could try and fit in with. I found groups for “childless” people, but in those groups of people they want to have kids, but don’t. That wasn’t the right fit for me either. So I needed to make my own place to fit in. I make jewelry, papercrafts, and do so in lots of places that are not my craft room. I know there must be others out there that have similar views and situations so I would like to offer this as a comfortable place for everyone to gather; we don’t even have to wait until the kids are in bed!